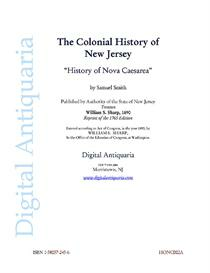 Smith''s History of Nova Caesarea is the bedrock of New Jersey history. This was the first compilation of facts, documents, and materials relating the colony, written by one of its most prominent citizens. The presentation deals extensively with the early settlements, government under the Proprietors, the transition to a Royal Colony, and notable events of the 17th and 18th centuries. Of special interest is Smith''s chapter on "The State of Indian Affairs," which records in detail the proceedings of the Treaty of Easton (1758, at which Smith took extensive notes). 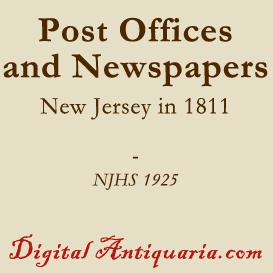 The 1890 appendix "John Tatham, New Jersey''s Missing Governor," by John D. McCormack is also included. Samuel Smith, author of the History of New Jersey," was eldest son of Richard Smith, esquire, of Burlington, member for twenty years of the Assembly of West Jersey, and a flourishing merchant in Burlington and Philadelphia. The author joined his father as a West India merchant, and settled at Burlington. His reading was extensive and accurate; the several historical works composed by him, showing the fruits of careful research, and a clear and agreeable style. He was the originator of the benevolent efforts which resulted in the colonization of the remnant of the New Jersey Indians at the "Brotherton" settlement; drew up, in 1757, the constitution of the "New Jersey Society for Helping the Indians," and signed its subscription list with twenty pounds. Samuel Smith filled some of the most important public offices in the Province of New Jersey. He was, for many years, a member and Secretary of the King''s Council, Treasurer of the Province, &c., &c. He died in 1776. His brother Richard was a member of the Continental Congress. 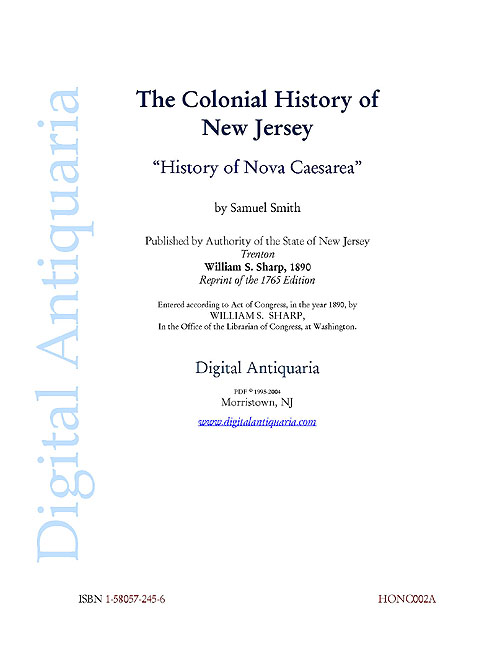 Smith''s "History of Nova Caesarea" is the bedrock of New Jersey history. This was the first compilation of facts, documents, and materials relating the colony, written by one of its most prominent citizens. The presentation deals extensively with the early settlements, government under the Proprietors, the transition to a Royal Colony, and notable events of the 17th and 18th centuries. Of special interest is Smith''s chapter on "The State of Indian Affairs," which records in detail the proceedings of the Treaty of Easton (1758, at which Smith took extensive notes). 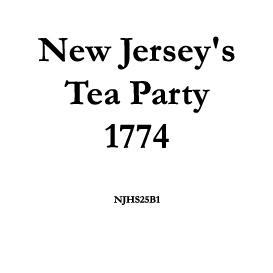 The 1890 appendix "John Tatham, New Jersey''s Missing Governor" is also included. Samuel Smith, author of the "History of New Jersey," was eldest son of Richard Smith, esquire, of Burlington, member for twenty years of the Assembly of West Jersey, and a flourishing merchant in Burlington and Philadelphia. The author joined his father as a West India merchant, and settled at Burlington. His reading was extensive and accurate; the several historical works composed by him, showing the fruits of careful research, and a clear and agreeable style. 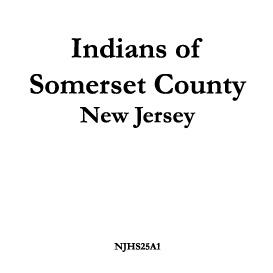 He was the originator of the benevolent efforts which resulted in the colonization of the remnant of the New Jersey Indians at the "Brotherton" settlement; drew up, in 1757, the constitution of the "New Jersey Society for Helping the Indians," and signed its subscription list with twenty pounds. This PDF edition presents Smith''s "History of Nova Caesarea" and its appendices in its entirety. The presentation is in portrait orientation; footnotes appear on the pages in which they are referenced; the book is fully-searchable and fully-printable (3.29Mb, 465 pages).